Everyone is Eating Mice – Imaginary and Real! 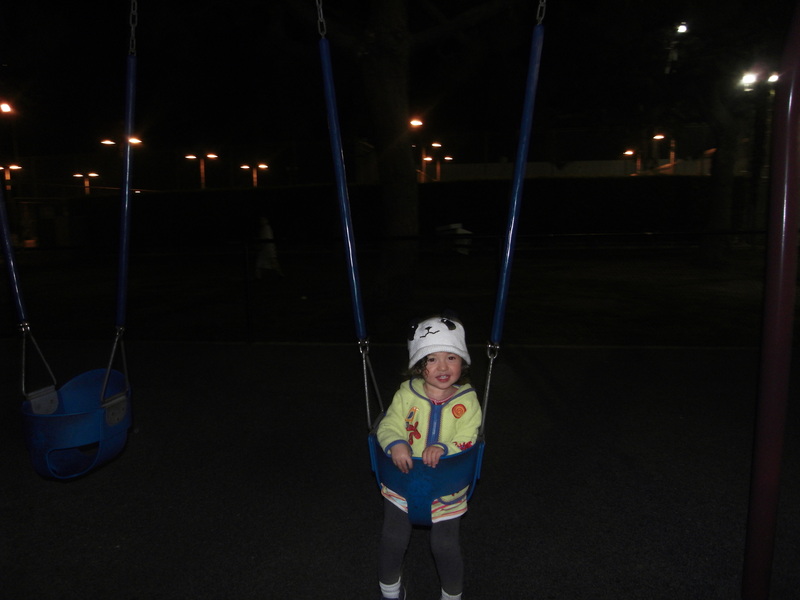 My husband had rehearsals until very late on Sunday so when Mia woke up from her nap and after we ate dinner, I asked her if she would like to go to the park and on the swings. It is one of her favorite things to do and usually a guarantee for an early evening – something I was hoping for. I pushed her on the swing for twenty minutes until the park cleared of all people. It was then she wanted to play a new game – catch and eat mice! 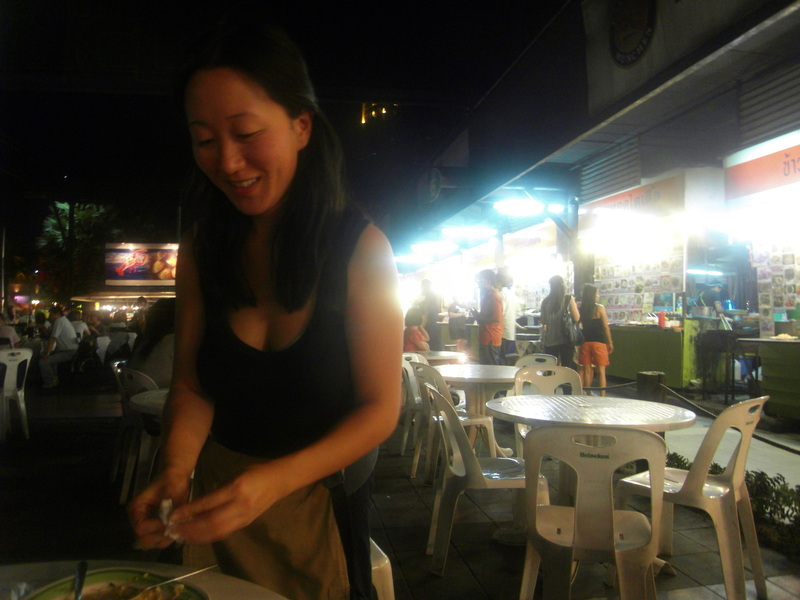 When we were at the Suan Lum Night Bazaar in Bangkok, I found Mishy feeding a rat during our dinner. When I saw this, I quickly picked her up and told her we are going to walk to Babba, who was paying the bill. For the rest of that whole evening, I was shaking in terror in the inside. On the outside, it was a cute story about how Mishy shares her food and how generous she is – she was giving the rat all of her seafood! At the night bazaar in Bangkok - after seeing Mishy feed the rat. I needed to clean my hands. 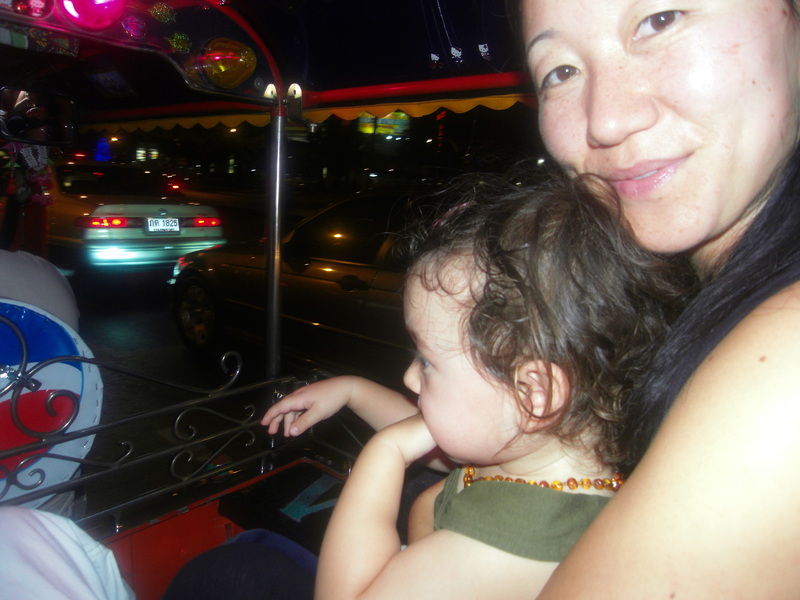 On the tuk tuk ride home from the night bazaar. We sprayed her hands with Clean Well ASAP after the rat incident. I wanted to scream that night. I used to live in a studio apartment in Toronto on College Street. When they tore down the old church across the street to make condos, my first floor apartment got infested with mice and that is how I developed my fear. I would hear them gnawing the walls at night and running back and forth from my living room/bedroom to the kitchen. Every morning, I found trails of mice feces on the kitchen floor, on the stove, on the kitchen table. When my landlord put down glue traps while I was out, I returned home to see three baby mice squeaking in terror. I ran to my parent’s place and made my father come over to my apartment to clean it up. He put the glue trap in a plastic bag and stepped on it. In front of me. So casually. I wasn’t always afraid of mice. I used to make fun of my mother’s fear by pretending I was a mouse and squeak when she came close. Her fear made me sad because I desperately wanted a hamster growing up. I had a substitute hamster at school. It wasn’t the same. And it died very quickly. A classmate had squeezed it too tightly. Since that episode in Bangkok, rats and mice fascinate Mishy. When we returned home, she instantly wanted to find mice so she could feed them. When we mentioned to her that our cat actually eats mice, she has wanted to catch and eat them too. She loves our cat. She is her “sister.” When she came up with the game today, I checked in with her to make sure it was a pretend game and then we played. On the way home, I narrated to her what our routine would be – we take off our shoes and socks, I start the bath while she picks out bath toys and dumps them in the bath, we undress together and take a bath. After the bath, we quickly put on lotion – she is now obsessed with this noni shea butter we got in Kona – then her nighttime diaper and her pajamas. We read a couple of books and go to sleep. She raised her fear about getting water in her eyes. I promise her I have no intention of putting water in her eyes and if water does go into her eyes, then it would be an accident. She agreed to the plan. I felt confident an early night was upon us. As we were getting ready for our bath, I felt something swishy underneath my right foot. There is was a small set of stomach intestines, liver and other organs on the bathroom mat. I didn’t scream, just grimaced and told Mishy, “I need to clean something up.” She looked at me curiously. “I need to clean up some mouse remnants. Kitty must have killed a mouse while we were at the park and she left its organs behind. Can you move a little bit closer to me so you don’t step on it accidentally?” She did. I got a little bit of toilet paper and scooped it up, flushing the last remains. Quickly, we went into the bath while my right foot continued to vibrate from touching the bits of mouse. If that had been the only real mouse encounter that night, my fear of mice would have still been a secret to Mishy. Unfortunately, while we were in the bath, our cat came into the bathroom with a mouse in its mouse. I screamed. And screamed and scream. I held on to Mia and screamed while Kitty ran out with the mouse. My right foot started pulsing again and I felt the same squishy feeling I had when I had stepped on the mouse’s entrails. Mia started screaming and crying. I quickly apologized, explaining what had happened. She asked me to repeat the story again and again while she cried. I checked in with her and asked if she was scared , if she needed comfort, reassurance, and security. She said, “yes,” and “more.” (“More” means to repeat the story and give her more details.) I let her know that I have a deep fear of mice, that I will be okay, that I just need a moment before we get out of the bath because I don’t know where our cat and the mouse are, that it scares me to think the mouse could be in the bedroom and if it isn’t, we are going to quickly rush in and close the door behind us. She let me have the moment and we quickly raced into the bedroom. I looked around and was relieved to not see the cat. I didn’t know where she was but she wasn’t in the bedroom and at least I knew it was safe. If the mouse was in the bedroom, I was hoping it had the good sense to hide from us. We quickly got dressed and I started reading her books. Then the scratching started. Kitty was scratching to get in. I screamed, “No, no, no Kitty!” and Mishy started crying again. I held her in my arms and apologized again. It was going to be a long night. And it was. 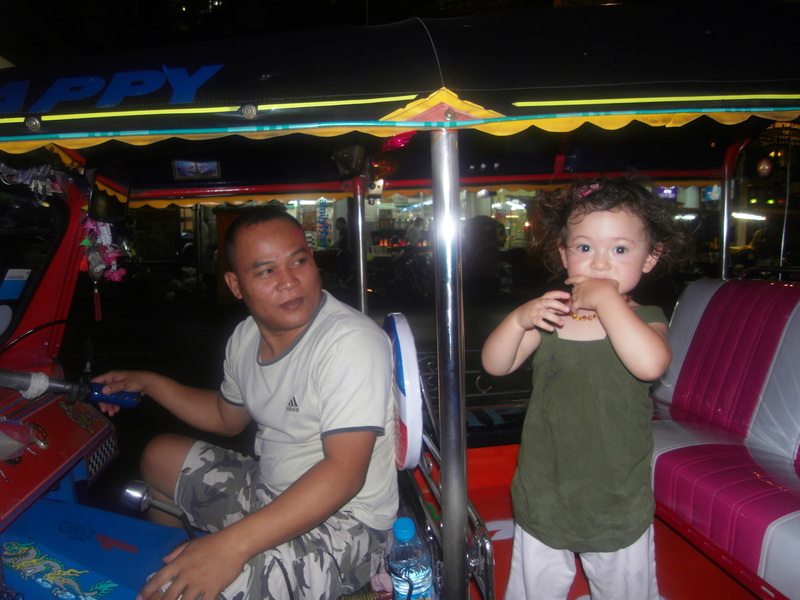 Bonus Photo: Mishy with the tuk tuk driver on the night of the night bazaar. She's teething. Maybe that's why she didn't want to eat her seafood.